Summer is coming soon, which means we’re about to enjoy peak moving season. Between the warm weather and longer hours of sunlight, it’s not surprising that summer is such a popular time for moving. Despite its popularity, this time of year can be extra stressful for the unprepared—mostly due to the general rush of thousands of people trying to secure moving companies or other moving resources at the very last minute. That’s why the secret to moving success is to plan the move before peak moving season is here. Starting early and staying organized are the keys to an enjoyable, relaxed moving project (and less stress for you and your household). 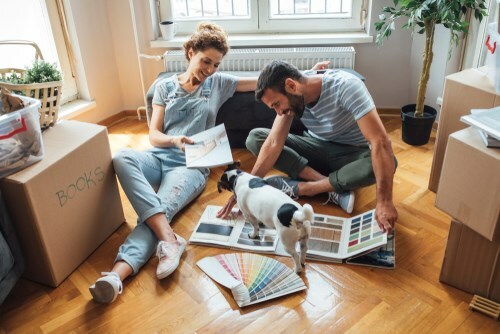 In this article, our team at Harrington Moving & Storage will reveal some of our favorite tips to get you organized for relocation—before peak moving season arrives. There’s nothing worse than a chaotic, stressful relocation, so take a moment to read through this list of helpful suggestions that will help you get started planning a smooth and successful moving experience. No move is easy without a dedicated moving plan, which is the backbone of any organized relocation experience. Well-established, reputable movers will help you prepare effectively with a professional moving calendar. This will help you stay on top of tasks in a timely manner, and to avoid falling behind and having to rush everything at the last minute—which is the number one cause of a badly planned and chaotic moving experience. Here are some of our most effective tips for planning a well-organized and efficient relocation. Start Planning: Whether it’s notebook, binder, or your to-do list app on your phone, the most important step before any other step is to get organized. Map out the tasks, packing lists, moving budgets, and any other bit of information needed to get organized before you pack even one box. Calculate Costs: Any great moving project needs a budget to follow. Some typical moving costs to plan for include your moving company, moving boxes and other additional supplies (although this is sometimes covered by the moving company, depending on your package), cleaning supplies, travel costs (gas, lodging, etc. ), oil changes and vehicle maintenance, pet care, accident and emergency funds, food and hotel expenses for long trips to the new destination. Change of Address Forms: Long before moving day arrives, be sure to visit your local post office and have your address changed. Make sure your mail, subscriptions, financials, and medical records are all set for delivery to your new address. Hire the right moving company: Get multiple quotes and verify the services offered by the moving company. In addition to affordability, you need a moving company that can provide the services you need. Shipping a vehicle or moving a piano? Make sure the moving company can handle it for you. Also, make sure they maintain compliance with federal and state laws and are well reviewed and trusted. Consider Overlap Time: Sometimes the day you have to leave the old home doesn’t coincide well with the day you take possession of the new home. Figure out what day you take possession and what is needed to actually live in the new place (like utilities being turned on) before arriving. The more you can plan this step out, the less stress you’ll have during the move. If it’s unavoidable, then make sure to plan for your hotel stay and get that booked, so you’re not scrambling on moving day. Pack Overnight Bags: These should be the last items you pack, and for a good reason. Your overnight bags should contain the things you’ll need while traveling and unpacking. This includes your clothes, shampoos, brushes, toothbrushes, contact lens solution, and anything else that’s crucial (like your charger cord and laptop). The essentials are the first things you want to be unpacked so you can start getting comfortable as soon as you arrive. At Harrington Moving & Storage, we are happy to move our customers to new locations all over the world—whether it’s before, after, or right in the middle of moving season. Like other award-winning moving companies in the country, our team is passionate about making the moving process as easy as possible for our customers, with superior moving and storage solutions and world-class customer service. That’s why we strongly encourage that all of our customers book their moves as early as possible, especially before peak season hits—to ensure that you book with the highest quality moving company you can find. Established in 1996, Harrington Moving and Storage has been the preferred moving company for New Jersey and New York residents. Striving for nothing less than 100% customer satisfaction, our team works with you to tailor the move to your needs. For more information about moving with us and avoiding the peak season for moving, give us a call now or fill out our online form for a free, in-home pricing estimate and consultation.